Paul Lango was a coach at Bartlett for 34 years. He coached the cross country, track, and golf teams where he compiled an outstanding record of 410 wins. His knowledge, ability, and style enabled him to be an influential coach and teach who impacted thousands of lives. He was the 200 meter and long jump champion at Bridgewater State. Coach Lango began coaching the Indians in 1973. The cross country team began a run of victories for Paul that today seems untouchable. Paul and his teams had 254 victories and, in 1979 and 1992, his teams went undefeated. In 1980, Paul took over the Bartlett track team and continued with his winning ways and attitude. He turned average athletes into great ones. 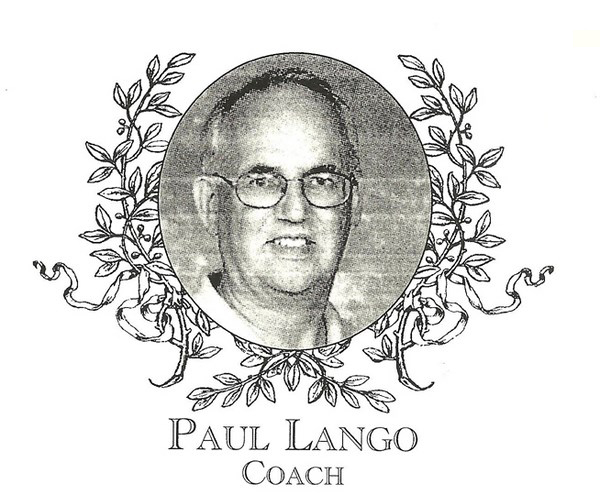 Many young men achieved personal successes and accomplishments because of Coach Lango�s contributions to the sport. Paul guided the track team to 149 wins in the 27 years, including four undefeated seasons and two District Class Meet Championships. Paul�s hard work and dedication to his teams and the BHS athletic family has been remarkable. The amount of success he has attained is covered and may never be duplicated. Paul taught students and athletes numerous life lessons. The enthusiasm and support that he put into each meet and season encouraged other coaches around him to be better and was no doubt a factor in his completion of two Boston Marathons. Paul�s coaching technique and style can never be duplicated. What each athlete has taken from Paul is a sense of pride and a great deal of honor. The legacy he left at Bartlett will be unmatched. Paul retired from Bartlett in 2007 and is now teach and coaching at Marianapolis Prep in Connecticut.